You will need to download a QR scanner to use this product. Using a QR scanner, have your students scan the QR codes and copy down the word that shows up onto the line below the picture for Near Point copying. They can then color the picture for fine motor practice. Copy and laminate for use in stations. Students could also try to spell the word prior to scanning and then correct their spelling if it is different than what comes up after scanning. 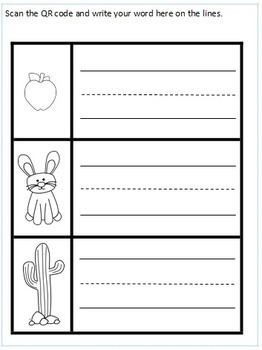 Cut and place individually at desks or around the room for students to travel to. I have also included the cards without a QR code and placed the vocabulary word below the picture. 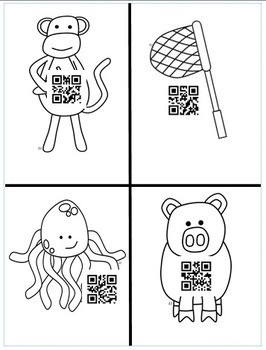 These can be used with the QR code picture cards as a matching game. This is a great activity for ESL students. If you download this product, I would love to hear back from you through feedback. 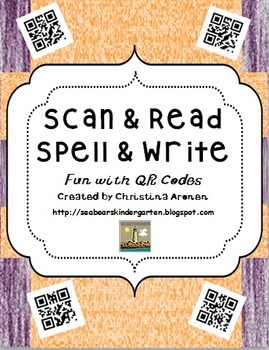 Scan and Read Spell and Write by Christina Aronen is licensed under a Creative Commons Attribution-NonCommercial-NoDerivs 3.0 Unported License.